K Wheeler set four world records as part of the U.S. Paralympic National Swim Team before taking on a new challenge: a double major at the UW with the goal of law school. Ambitious, yes, but Wheeler hasn’t had to go solo: Mentors with the UW’s Disabilities, Opportunities, Internetworking and Technology (DO-IT) Center have supported Wheeler, as with other youth with disabilities, to achieve their full potential. Thanks to its extensive mentoring programs, DO-IT is among this year’s recipients of the prestigious Susan M. Daniels Mentoring Hall of Fame award. The national award, granted by the National Disability Mentoring Coalition, recognizes outstanding leaders that have demonstrated a commitment to mentoring and have shown a positive impact on improving the lives of people with disabilities. DO-IT has long supported people with disabilities through mentoring, and was among the first in the world to implement Internet-based mentoring for youth with disabilities. Those mentored through DO-IT programs often are inspired mentors themselves, including Wheeler. DO-IT is a community of people with and without disabilities with a common goal of academic and career success for everyone regardless of disability. DO-IT’s mentoring programs are geared toward high school and college students, who like Wheeler, plan to pursue challenging careers. 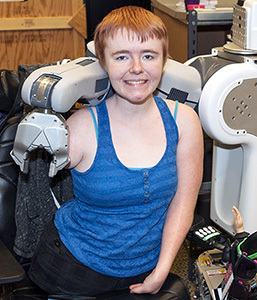 Participants are mentored by other college students, faculty, engineers, scientists and other professionals, many of whom also have disabilities. DO-IT programs also include disability training for educators, employers and service providers. Its publications and best practices are disseminated worldwide. The Hall of Fame award is named after longtime disability rights advocate Susan M. Daniels, who contracted polio as an infant. Daniels spent much of her early life in rehabilitation institutes and hospitals, yet kept up her studies and went on to earn a doctorate in psychology. She spent her internationally recognized career as a disabilities rights advocate in academia, government and as a private consultant. Learn more about DO-IT’s programs on its website, and check out the new DO-IT Retrospective: 25 Years of Success that delves into the Center’s history of helping to empower people with disabilities.